Jolly Rosa is at Shiraz Mazzeh in front of Orchard Takashimaya. Shiraz Mazzeh is a Persian cuisine food stall in Singapore selling Kebab and various drinks. Takashimaya is a departmental store in Ngee Ann City shopping mall along Orchard Road, the most tourist infested place in Singapore. Most people just call this shopping mall Taka, an abbreviation for Takashimaya instead of Ngee Ann City. Shiraz Mazzeh mainly sells Shawarma, more commonly known as Kebab. I'm sure everyone knows what a Kebab is and surely has eaten one before. Shiraz Mazzeh sells 3 different kind of Shawarma - chicken, lamb and beef. Oh, Justin Bieber is on the lcd screen, too obvious to miss it. Notice some huge sausages behind Jolly Rosa too. Here's a look at the Shiraz Mazzeh menu on the counter. Other than Sharwarma, Shiraz Mazzeh also sells German sausages and some side orders like french fries. The real reason why Jolly Rosa is here, is the Mazzeh Happy Hour 1 for 1 draught beer! $7.50 for 300ml and $9.50 for a pint (500ml). At Shiraz Mazzeh, there are two types of draught beer - Warsteiner premium verum and König Ludwig Weissbier. Both German beers and sister companies. Both are quite popular beers in Singapore and very easy to find almost everywhere but if you haven't tried them before, you can have both at Shiraz Mazzeh due to the 1 for 1 beer happy hour promotion! Here is Jolly Rosa having her first drink, the König Ludwig Weissbier. The term Weissbier refers to wheat beer which is a unique kind of beer. Wheat beer is creamy in nature and is usually sweeter in taste with a big hint of wheat in them. Let's stop here before we continue talking 10 pages about beer! Hey Jolly Rosa, its Mazzeh happy hour 1 for 1 promotion, should you find a friend to join you? 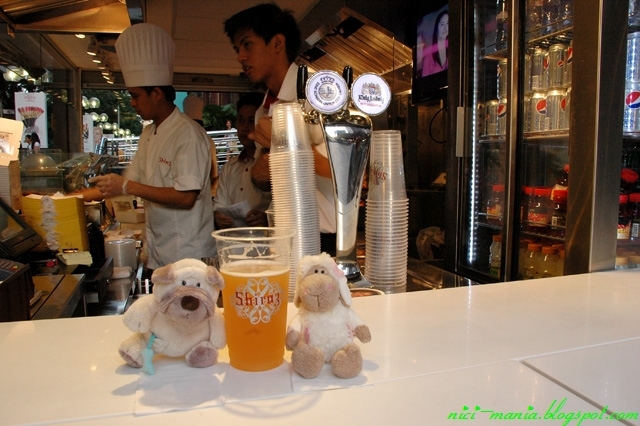 Here is NICI pug joining Jolly Rosa for the happy hour 1 for 1 beer at Shiraz Mazzeh. These 2 nici plüsch intends to get drunk tonight! After Jolly Rosa finishes the first cup of König Ludwig Weissbier wheat beer, here is the Warsteiner premium verum beer - a classic pilsner beer. Pilsner is a light beer bitter in taste, it is brighter in color and less opaque compared to wheat beer. Your typical Carlsberg and Tiger beer are all pilsner. Oh no we are talking about beer again! This is the leaflet which can be taken at the counter of Shiraz Mazzeh. Other than Orchard Takashimaya, there are 3 more of these stalls in Singapore. Experience the finest Kebabs you can ever taste. Thats what Shiraz Mazzeh wrote here on their leaflet, $8.50 for one is expensive for a Kebab compared to the delicious Kebab we had at Poland. And if you pay 1 more dollar you can drown yourself in 1 litre of beer. This is the view on our left side sitting at Shiraz Mazzeh. Orchard Takashimaya is on our right and Paragon shopping mall is what you see now. The massive amount of branded shops along Orchard road is the main tourist attraction here in Singapore. The view behind us is Orchard road. 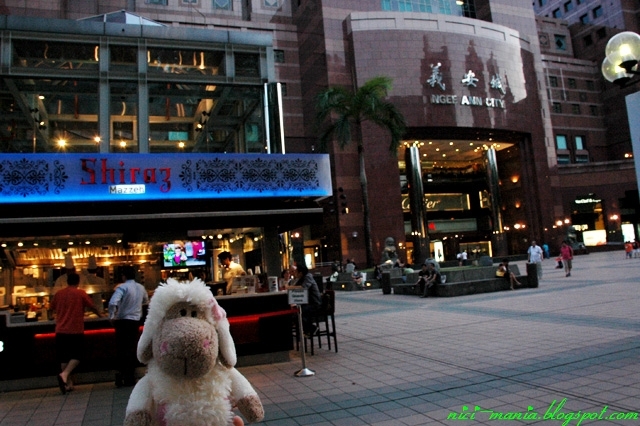 The bright red sign says TakashimayaSC on the middle left and the top left blue sign is Wisma Atria. Jolly Rosa drunk at Shiraz Mazzeh with her third cup of beer, another König Ludwig Weissbier wheat beer. Jolly Rosa sleeps further down, she's seeing stars already. Meanwhile we haven't seen NICI pug around, where is he anyway? NICI pug is busy taking pictures of himself near Orchard Takashimaya, showing you the night views of the busiest street in Singapore. Rosa is drunk at the counter of Shiraz Mazzeh, we are bringing both of you home alright. Not long after we left Shiraz Mazzeh, Rosa saw a street performer busking in front of Takashimaya, not sure what is he trying to express with the scary paint job on his body. I hope that Jolly Rosa did not catch a hangover hahaha. my jolly sheebo, Robin travels the world with me too!!! What a lucky girl, that Jolly Rosa, drinking beer and enjoying a good night's out. Thnx for sharing! Robin is a very lucky sheep! Next time we will bring other plushies for drinks outing. Much more to come! Hello Leona, you made us miss Germany already! The taste of the wheat beer there is unforgettable. Rosa hopes to join Ute for a wheat beer drink when we visit in the future! This a great venue.I have to visit the place on my next trip to Singapore.